Another year, another set of missions to monitor, and launch. However, we will be bidding adieu to two missions currently orbiting the inner planets Venus, and Mercury. For those who don’t know, the Venus Express is a mission sent by the European Space Agency (ESA). The mission was sent to study the atmosphere, clouds, the plasma environment and the surface of Venus from orbit. The mission was designed to last for 500 days, but the mission was extended 3 times.It lasted for eight years in orbit, completed all its scientific goals, and performed a dangerous aerobraking maneuver, which gradually brought the orbiter down 130 km above the surface. Unfortunately, On November 28, 2014, things took a turn for the bad as the ESA lost contact with the craft. They did regain contact with the craft, but are receiving only little bits of information. Sadly, they discovered that it most likely ran out of fuel. On December 16, 2014, the ESA ended the mission leaving the probe to kiss the atmosphere until it burns up. That is expected to happen early January.This spacecraft provided a lot of information from its actions, and discoveries, which will be applied to the next generation of spacecrafts. The same fate is also going to happen to another inner planet mission, but unlike Venus Express, it got more time than expected. 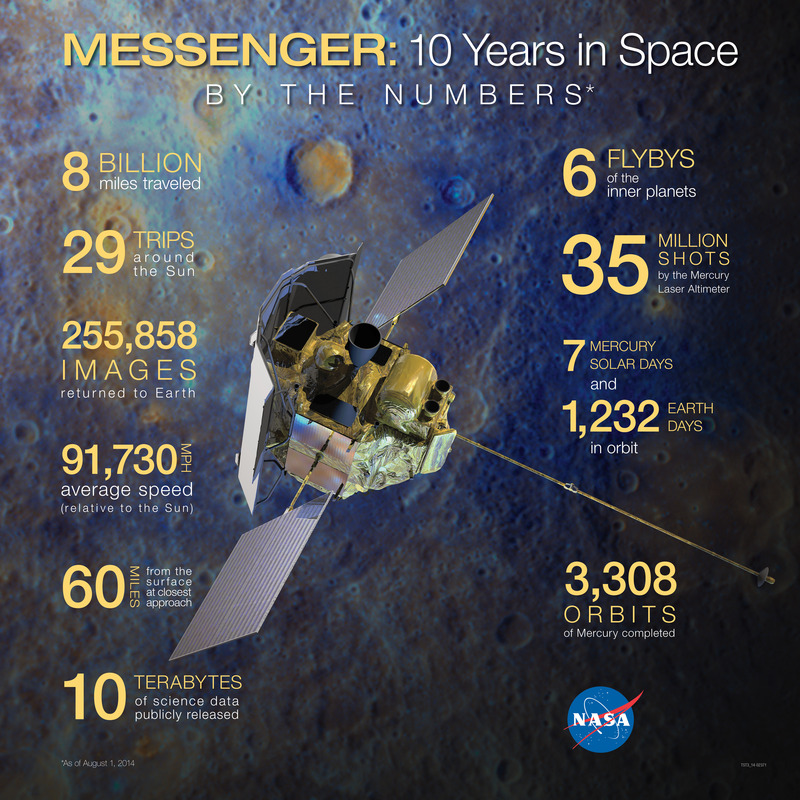 For those who don’t know, MESSENGER is a spacecraft sent to Mercury by the National Aeronautics and Space Administration (NASA). It was launched into space on August 3, 2004. This mission is unique, because it is the second spacecraft to fly-by Mercury, and the first to orbit Mercury! It started collecting data on April 11, 2011, and finished its main goals in March 17, 2012. It completed its mapping of Mercury on March 6, 2013, and also completed its two extended missions. After 10 years of being in space, travelling over 8 billion miles, taking over 255,858+ images, and completing 3,308 orbits of Mercury, its fuel is finally exhausted and is poised to impact Mercury early this year. Luckily, some engineering ingenuity gave it more time. All its propellant is used up, and will eventually collide with Mercury, but its helium supply, used to pressurize the propellant, can be used to adjust its trajectory, delaying its fate by over a month. Despite its fate, it revealed to us many topics of interest. Water ice was found in some of Mercury’s permanently shadowed craters. The atmosphere and weak magnetic field lines are influenced by the Sun. There is a lot more to discover, and that will be the job of future missions. These missions have worked hard to provide data for us back on Earth, but with the conclusion of these missions means that the inner planets will no longer have any active orbiters present in their vicinity. The inner planets will not be monitored up close anymore. Hopefully, NASA, ESA, or any other space agency will soon launch another mission to Venus or Mercury to collect more data, and make more discoveries on these planets.